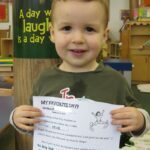 “All About ME” week was a huge success! We learned so much about each other! The students completed their homework assignment and had the opportunity to help present the beautiful “All About ME” posters throughout the week. These posters proved to be amazing classroom wall decorations! Be sure to pop in and view them during your next visit to PPA! They are really wonderful! On Monday, the students created their very own self portraits. 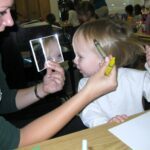 With the help of the teachers, the students looked at their reflections to choose the appropriate colors to match their hair, eyes and clothes. The students began by adding the eyes to their empty stick figure head. After gluing their eyes on their face, the students added a self-drawn smile. Next, the students had to examine their hair color to determine which crayon to use. 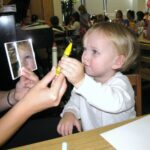 The photo below shows one student deciding which crayon is the better fit. 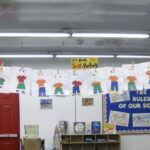 Once all of the self-portraits were complete, the teachers used string and some clothespins to display them proudly in our classroom. 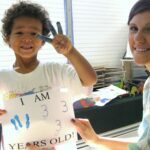 On Tuesday, the focus of the day was “How Old Am I?” During the morning, the students practiced tracing the number of their age and also practiced expressing the quantity of their age on their fingers. Using some paint, the teachers attempted to imprint the students hand on the paper. Although some turned out looking more like Rorschach inkblot paintings, it was still fun to try to capture the image. Below are two examples of some students working. In keeping with the “How Old Am I” theme, the students used stampers to chart their ages in the afternoon. We found out that we our classroom consists of mainly three years old, followed by four year olds, while the two years old were the smallest group. The teachers made sure to give each group a star that day because everyone – two, three, or four years old – deserves a star! On Wednesday, the theme of the day was “How Tall Am I?” The students were measured on two different height charts – one for boys and one for girls. The height charts were great but a little abstract for young children. It is quite difficult to conceptualize that a little line above your height line means someone is taller and a little line below your name means that someone is smaller. To help demonstrate exactly what it means to be taller than someone, the teachers created a blank wall poster and elicited the help of a tall friend and a small friend. First we traced the “tall” student. Then we traced the “small” student. Afterwards, the students were able to see that the small students head was “lower” or shorter than the tall students head and the taller students head was “higher” or taller than the shorter students head. Thursday’s focus was “What is my name?” It is a tradition at Park Prep for the teachers to be super silly while calling the students to go wash their hands before eating times. For instance, with a switch of a letter Miss Justine becomes Miss Dustine or Miss Nustine! Not only is this a fun game for the students and teachers alike, it helps reinforce the sounds of letters and several other key literacy concepts! The morning work involved students mixing up their own names and then figuring out which one was right. 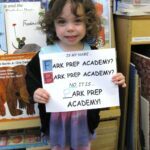 We had the following student hold up a Park Prep Academy name sign rather than her actual artwork. Friday’s theme was “My Favorites!” The teachers put together a “My Favorite Day” story; however, it was missing quite a bit! Fortunately, the students were more than up for the job to fill in the missing parts to their liking. The teachers read the story and stopped at all the blanks to record the student’s responses. Some of the stories included run in with magical alligators and turtles to witch fairies. The students had a blast listening to their completed story as it was read back to them. What a fun week and informative week! Now that we all know all about each other, we need to learn how to be friends with one another! 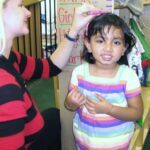 Friendship week should really help us all get along and have even more fun at preschool!